PRINCETON, N.J. -- Americans are taking global warming more seriously than at any time in the past eight years, according to several measures in Gallup's annual environment poll. Most emblematic is the rise in their stated concern about the issue. Sixty-four percent of U.S. adults say they are worried a "great deal" or "fair amount" about global warming, up from 55% at this time last year and the highest reading since 2008. Mirroring this, the March 2-6 survey -- conducted at the close of what has reportedly been the warmest winter on record in the U.S. -- documents a slight increase in the percentage of Americans who believe the effects of global warming have already begun. Nearly six in 10 (59%) today say the effects have already begun, up from 55% in March 2015. Another 31%, up from 28% in 2015, believe the effects are not currently manifest but will be at some point in the future. 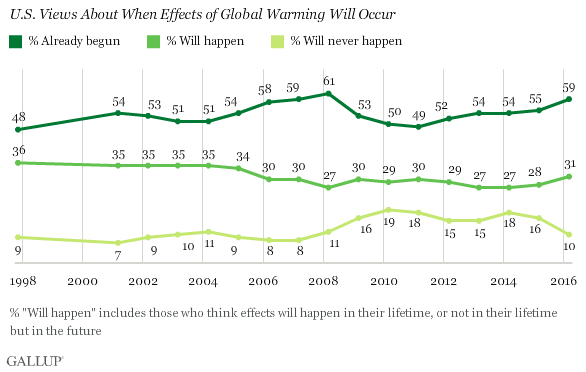 That leaves only 10% saying the effects will never happen, down from 16% last year and the lowest since 2007. 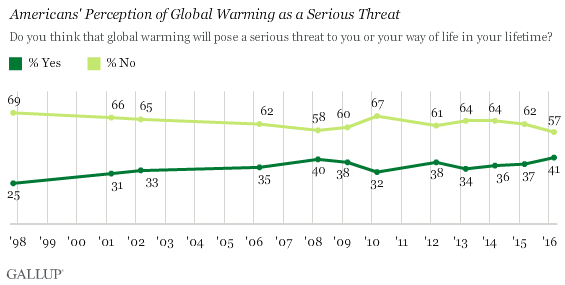 A third key indicator of public concern about global warming is the percentage of U.S. adults who believe the phenomenon will eventually pose a serious threat to them or their way of life. Forty-one percent now say it will, up from 37% in 2015 and, by one point, the highest in Gallup's trend dating back to 1997. Americans' clear shift toward belief in global warming follows a winter that most described in the same poll as being unusually warm. Sixty-three percent say they experienced an unusually warm winter, and the majority of this group ascribes the warm weather pattern to human-caused climate change. That finding relates to another record broken in the new poll -- the 65% of Americans now saying increases in the Earth's temperature over the last century are primarily attributable to human activities rather than natural causes. This represents a striking 10-percentage-point increase in the past year and is four points above the previous high of 61% in 2007. Concern about global warming has increased among all party groups since 2015, although it remains much higher among Democrats than Republicans and independents. 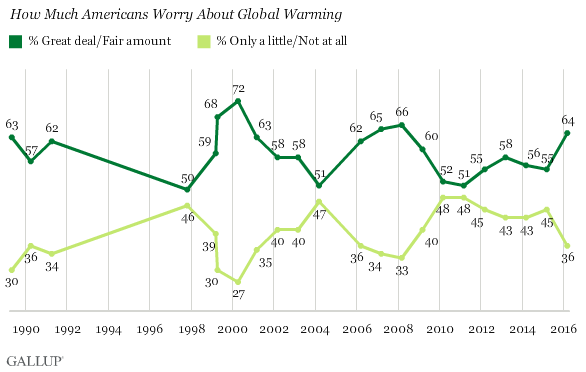 For example, 40% of Republicans say they worry a great deal or fair amount about global warming, up from 31% last year. The percentage of independents expressing concern has also increased nine points, from 55% to 64%. Democrats' concern is up slightly less, from 78% to 84%. Democrats and independents also show double-digit increases in the percentages attributing warmer temperatures to human activities. Republicans show a more modest uptick of four points on this question. A confluence of factors -- the economic downturn, the Climategate controversy and some well-publicized pushback against global warming science -- may have dampened public concern about global warming from about 2009 to 2015. However, Americans are now expressing record- or near-record-high belief that global warming is happening, as well as concern about the issue. Several years of unseasonably warm weather -- including the 2011-2012, 2012-2013 and 2015-2016 winters -- has potentially contributed to this shift in attitudes. If that's true, continuation of such weather patterns would likely do more than anything politicians and even climate-change scientists can to further raise public concern. Results for this Gallup poll are based on telephone interviews conducted March 2-6, 2016, with a random sample of 1,019 adults, aged 18 and older, living in all 50 U.S. states and the District of Columbia. For results based on the total sample of national adults, the margin of sampling error is ±4 percentage points at the 95% confidence level. All reported margins of sampling error include computed design effects for weighting. Conservative Republicans are the only major political party/ideology group to believe the effects of global warming will not happen in their lifetime. They are also the only group to say global warming is due to natural changes in the environment. 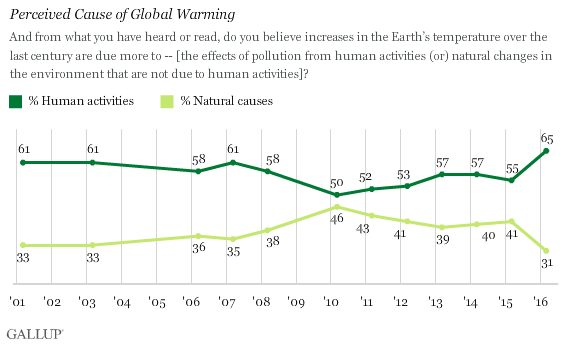 Americans' concern about several different environmental problems has eased after increasing last year. Americans worry most about polluted drinking water and least about global warming. 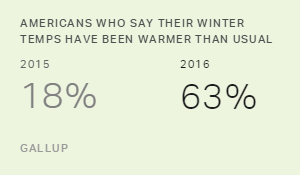 Most Americans say this winter was warmer than usual, in sharp contrast to the 51% in 2015 who said last winter was colder. Of those who say this winter was warmer, more attribute this to climate change than to natural variation.